Amelogenesis imperfecta (AI) is a hereditary disorder caused by mutations of genes primarily involved in the enamel formation. Several different types of AI have been identified, based on the phenotype and on the mode of inheritance. Regardless of the type, the dental treatment tends to be the same, favoring the complete removal of the compromised enamel late in the patient's life. With the new dentistry guidelines that orient clinicians towards minimal invasiveness, it should be mandatory to intercept patients affected by AI earlier, not only to protect the dentition from further degradation but also to help patients improve their self-esteem. This article examines the restorative dentistry performed on a 24-year-old Caucasian female suffering from the hypoplastic type of AI, using only adhesive procedures. Due to the complex needs of the patient, an interdisciplinary approach was followed, involving orthodontics, periodontics, and restorative dentistry. A full-mouth adhesive rehabilitation was achieved by means of direct composite restorations, veneer/onlays and facial/palatal veneers. No elective endodontic therapy was necessary for restorative purposes. The esthetics, mechanics, and biological success were achieved and maintained. The bond to the enamel did not show signs of degradation (eg, discoloration or infiltration) even after 5 years of function. 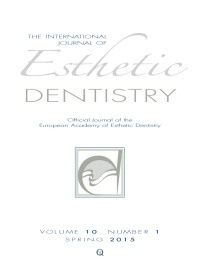 This is encouraging as it shows that adhesive techniques may be a reliable approach even in the presence of a compromised enamel layer. A concept is proposed for an approach to the learning of dental morphology and occlusion. Dental morphology, function, and esthetics should reflect a fundamental driving force, that is, the faithful emulation of the natural dentition's structural (functional, mechanical) and esthetic properties. The innovative part of the proposed approach is the emphasis on visual arts and the 2D-3D-4D aspect that starts with drawing (2D/3D) and continues with partial wax-up exercises that are followed by labial waxups and, finally, full wax-ups using innovative technical aids (electric waxers, prefabricated wax patterns, etc). Finally, the concept of layers (4D) and the histoanatomy of enamel/dentin and optical depth are taught through the realization of layering exercises (advanced acrylic mock-ups and composite resin restorations). All these techniques and materials are not only used to teach morphology and occlusion, but also constitute essential tools that will be of significant use for the student dentists and dental technologists in their future daily practice. The clinical significance of the presented methodology should allow not only students but also practicing dentists and dental technologists to help their youngest collaborators to develop a deep sense of morphology, function, and esthetics. The aim of this article is to propose a standardized protocol for treating all inesthetic anterior maxillary situations using a well-planned clinical and photographic technique. As inesthetic aspects should be treated as a pathology, instruments to make a diagnosis are necessary. The prosthetic design to resolve inesthetic aspects, in respect of the function, should be considered a therapy, and, as such, instruments to make a prognosis are necessary. A perspective study was conducted to compare the involvement of patients with regard to the alterations to be made, initially with only a graphic esthetic previsualization, and later with an intraoral functional and esthetic previsualization. Significantly different results were shown for the two techniques. The instruments and steps necessary for the intraoral functional and esthetic previsualization technique are explained in detail in this article. The development and reliability of adhesive resin composite systems have offered clinicians a further option for the management of tooth-surface loss. Patients with minimum, moderate, and severe hard tissue wear can be treated based on the application of minimally invasive adhesive composite restorations for posterior and anterior worn dentition. This article presents the "index technique", a new and very conservative approach to the management of worn dentition. The technique allows for a purely additive treatment without sacrificing healthy hard tooth tissue. It follows the principles of bioeconomics (maximum conservation of healthy tissue) and the reinforcing of residual dental structure. Depending on the severity of enamel and dentin wear, the number of caries, and the size of existing restorations, different treatment options can be applied to each tooth: direct and indirect partial restorations or full crowns. It is essential to diagnose and treat tooth-surface loss in order to properly restore biomechanics, function, and esthetics by means of adhesive restorations. This article proposes that the index technique is a fast and conservative approach for the planning and management of a fullmouth adhesive treatment in all cases of worn dentition. The technique is based on stamping composite directly on the tooth surface by means of a transparent index created from the full-mouth wax-up following an initially planned increase in occlusal vertical dimension (OVD). Domínguez, Gustavo Cabello / Fernández, David A. González / Calzavara, Dino / Fábrega, Javier G.
Recently, a number of clinical and animal studies have been published suggesting the advantages of using immediate post-extraction implants under a flapless protocol, followed by the simultaneous placement of an implant-supported provisional restoration (Trimodal Approach [TA]). Indications and risk of complications of this therapeutic option have also been thoroughly discussed in the literature. Different protocols have been advocated in order to minimize the possible esthetic impact of the post-extraction remodeling of the bundle bone. These include a correct implant position, a flapless approach, the use of an immediate implant-supported provisional restoration, and filling the osseous gap with different biomaterials or thickening the mucosal compartment through softtissue grafts. These techniques have been mostly indicated when intact alveolar walls are present at the time of tooth extraction. In this article, the conventional TA is described. Thereafter, variations of this option are discussed, being the modification of the osseous compartment (TAO), and the modification of the mucosal and osseous compartments (TAOM). Paula, Eloisa Andrade de / Tay, Lidia Yileng / Kose, Carlos / Mena-Serrano, Alexandra / Reis, Alessandra / Perdigão, Jorge / Loguercio, Alessandro D.
The aim of this study was to evaluate the 6- and 12-month clinical performance of four adhesion strategies from the same manufacturer (Kerr) in non-carious cervical lesions (NCCLs) using two evaluation criteria. Thirty-five patients, with at least four NCCLs each, participated in this study. After samplesize calculation, 180 restorations were assigned to one of the following groups: OFL (Optibond FL), OSP (Optibond Solo Plus), XTR (Optibond XTR), and AIO (Optibond All-In-One). The composite resin Filtek Supreme Ultra (3M ESPE) was placed incrementally. The restorations were evaluated at baseline, after 6 months, and after 12 months, using both the FDI and the USPHS-modified criteria. Statistical analyses were performed with Friedman repeated measures, ANOVA by rank, and the McNemar test for significance in each pair (α = 0.05). Six restorations (2 for OFL, 1 for OSP, 2 for XTR, and 1 for AIO) were lost at 12 months (P > 0.05 for both evaluation criteria). Marginal staining was observed in seven restorations using the FDI criteria (P > 0.05) and three restorations using the USPHSmodified criteria (P > 0.05). Eight restorations (2 for OSP, 3 for XTR, and 3 for AIO) were classified as Bravo for marginal adaptation using the USPHSmodified criteria (P > 0.05). However, 62 restorations (14 for OFL, 12 for OSP, 15 for XTR, and 21 for AIO) were classified as Bravo using the FDI criteria (P > 0.05). The four adhesion strategies showed similar clinical retention at 6 and 12 months. The FDI evaluation criteria tend to be more sensitive than the USPHS-modified criteria. The purpose of this study was to evaluate the influence of surface treatments and thermocycling on the microtensile bond strength (μTBS) of self-adhesive resin cement to human enamel and dentin. Eighty human third molars were selected. The crowns of 40 teeth were transversally sectioned, exposing the mid-coronal dentin. The buccal surfaces of the other 40 teeth were grinded to obtain a 5 mm2 flat enamel area. Eighty resin blocks were produced and cemented to the dental surfaces with RelyX Unicem, then grouped according to the surface treatment (n = 10): UnicemC with no conditioning, UnicemP with 37% phosphoric acid/15 s, and UnicemPA with 37% phosphoric acid/15 s plus adhesive bonding (Single Bond 2). There were two control groups, one for enamel and the other for dentin: VR with 37% phosphoric acid/15 s plus adhesive bonding (Single Bond 2) plus Variolink II. The enamel-dentin resin cement blocks were sectioned to produce non-trimmed bar specimens, which were divided into two storage conditions: dry, μTBS immediately after cutting; TC (5,000 x; 5°C/55°C). The samples were submitted to μTBS, and data were statistically analyzed by ANOVA and Tukey's test. The results showed statistical differences between UnicemC and the others. UnicemPA and VR showed better bond strength to dentin during the period before and after thermocycling, respectively. For the enamel, UnicemP showed better bond strength for both situations. Only for UnicemPA did the thermocycling significantly decrease the bond strength values. Within the limits of this study, it could be concluded that the bond strength is influenced by the surface treatments, and that thermocycling decreases the bond strength of all groups, but significantly only for UnicemPA. In developed countries, clinical manifestation of carious lesions is changing: instead of dentists being confronted with wide-open cavities, more and more hidden caries are seen. For a long time, the focus of the research community was on finding a method for the detection of carious lesions without the need for radiographs. The research on Digital Imaging Fiber-Optic Transillumination (DIFOTI) has been an active domain. The scope of the present article is to describe a novel technology for caries diagnostics based on Near Infrared Digital Imaging Transillumination (NIDIT), and to give first examples of its clinical indications. In addition, the coupling of NIDIT with a head-mounted retinal image display (RID) to improve clinical workflow is presented. The novel NIDIT technology was shown to be useful as a diagnostic tool in several indications, including mainly the detection of proximal caries and, less importantly, for occlusal caries, fissures, and secondary decay around amalgam and composite restorations. The coupling of this technology with a head-mounted retinal image system allows for its very efficient implementation into daily practice.